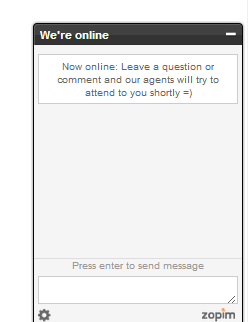 We are now using the Zopim live customer chat software in order to provide an even better customer support. Our entire team, including developers, customer support reps and our founder & CEO is logged into the Zopim Dashboard in order to answer your questions as fast as possible. If we are not online (sleeping, working hard, team meeting, in the pub), then the Zopim software still provides you with a contact form which you can fill out within seconds. We then will reply to you as fast as possible!